Well, the end of summer is upon us. Look around at all of the things you didn’t fix or get done. Then, grab a cold beer, take a big drink and forget about it. There are more important issues, like, what are we going to have for the big Labor Day barbecue. And, luckily, I have a great suggestion to wow the troops. I want you to try Grilled Pizza. It seems scary at first, but it is amazingly easy to do. The first time I saw the recipe was in the Joy of Cooking, one of the top three cookbooks of all time. We’ve come up with a few improvements. Try it and you’ll be happy you did. 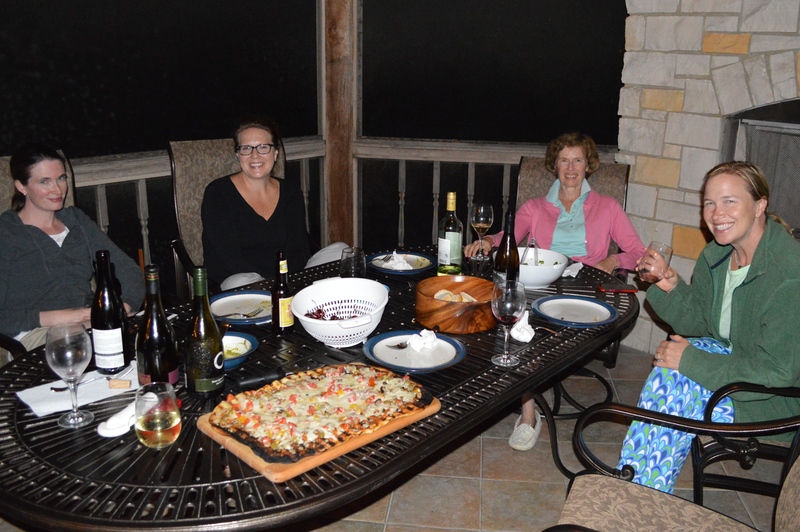 Last year, we got together again for a pizza cook-off. I brought all my thin crust stuff including my pizza stone. I even rolled out my now famous “Black Olive and Cheese Pizza”. I got a few condescending nods of approval, but I knew that they had something up their sleeve. They turned on the gas grill and the next thing I knew there was a large rectangular pizza dough spread on the grill. A few minutes later, there were some excessive, I thought, flourishes with spatulas, the grill was opened and the dough flipped. Toppings were quickly added and grill closed again. In another few minutes, out came a brilliant Margarita pizza. They had clearly bested me again. I immediately went to my car a left the country. 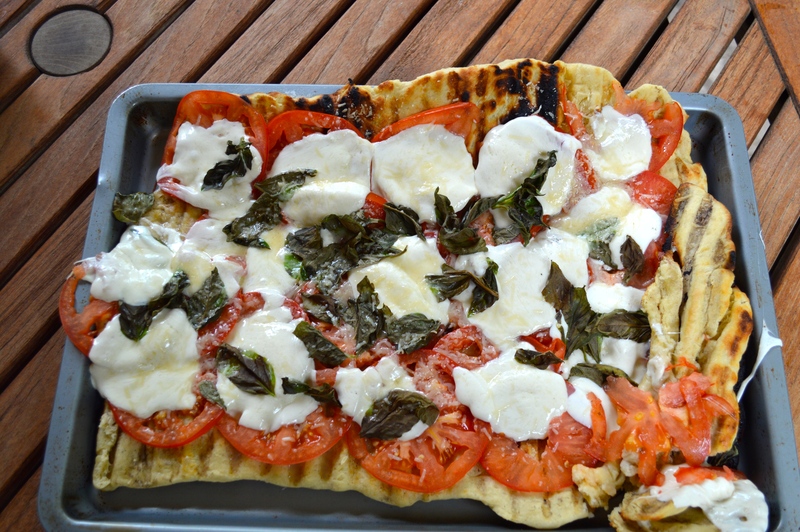 Since that rather trying experience, I have tried Grilled Pizza a number of times, always with good success. Here’s how to do it. For the dough: 10 minutes to make and 90 minutes to rise. Dissolve the yeast in the warm water, stir well and let sit for a couple of minutes. Mix the flour, salt and olive oil together in a mixing bowl. Add the water/yeast mixture and stir well. Put a little flour on your hands and take up the dough. Scrape everything out of the bowl, and knead the dough with your hands for three or four minutes until it gets smooth, elastic and a little warm. Put about 1 tbsp. of olive oil in the mixing bowl, spread around, and put the dough into the bowl, rolling it around a little bit. Cover the bowl with a dishtowel and let the dough rise for 90-120 minutes. 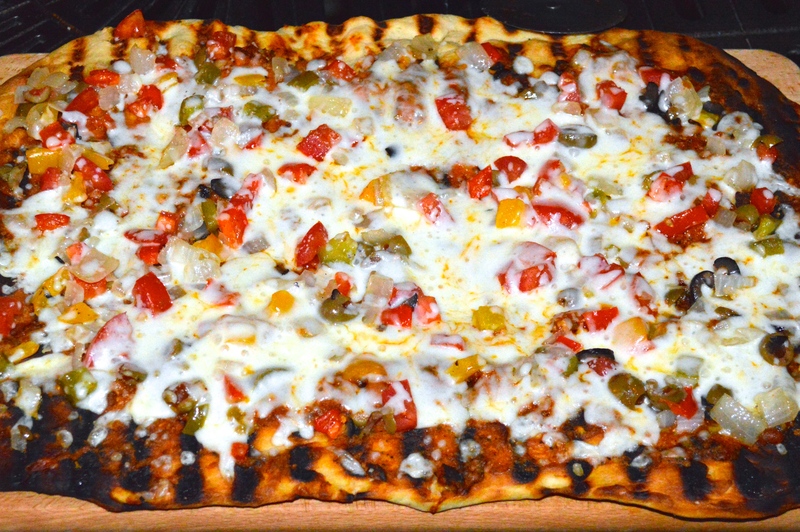 If you are make the Summer Veggie and Olive Pizza, sauté the peppers and onions for about three minutes to soften them a little. Start your gas grill and set to medium high. A three -burner type is perfect. A charcoal grill will also work as long as it is big enough. Invert a rectangular baking pan and brush the top with a little olive oil. 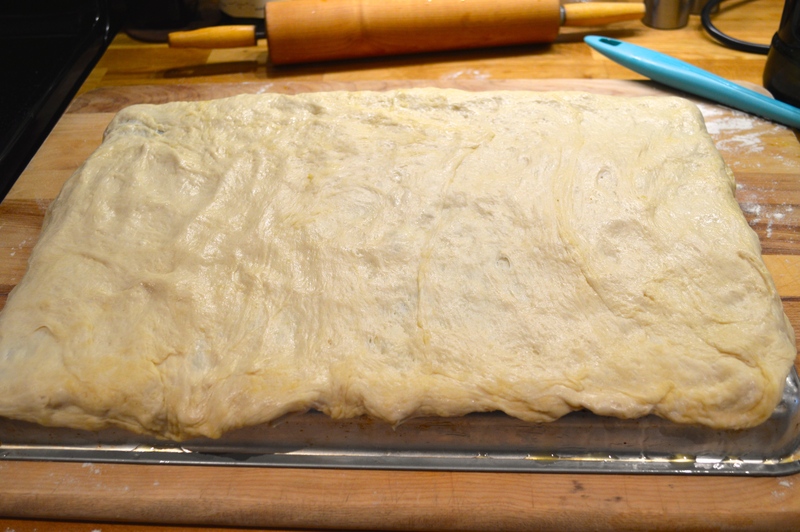 Spread the pizza dough over the entire surface by hand. You will find that it spreads out easily. Open the grill, flip the pan right side up on top of the grill and gently lift off. Take your time and it will come off easily (this is almost a philosophical statement about so many things). Now the dough should be spread evenly on the grill. Close the top and bake for four minutes or until the dough is nice and brown on the bottom. Flip the dough with two spatulas. For a little Bravado flair, get someone to help you and make a show of it. Add the ingredients, close and bake for another four minutes or until the cheese is melted and the crust nicely browned. Let cool for two minutes and cut into square pieces. This dish is the sexiest thing since Jessica Lange in “The Postman Always Rings Twice”. Enjoy! Love it! Thanks Tio Bill!